Join Chef Nese for a special Turkish cookery class as she celebrates the launch of her new book Turkish Yummies. 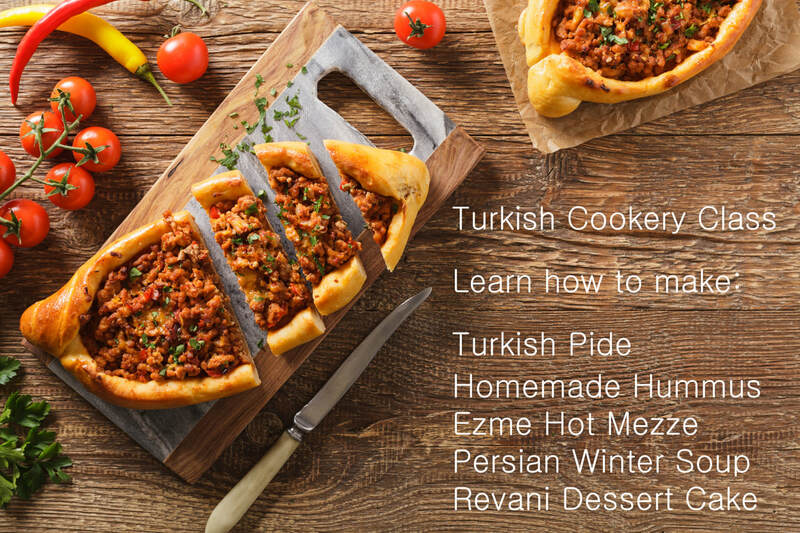 Nese has been teaching Turkish Cookery in Istanbul for a number of years so we are particularly blessed with having her teach a special Turkish Cookery Class here in London with London Cookery School. Copies of her book are also available on the day. Learn how to make 5 different things with chef Nese in this special class. Learn how to prepare home-made hummus. Once you have made this you will never buy shop-bought ones again! One of the most popular Turkish Mezzes, zingy spicy refreshing salad dip featuring pomegranate juice and sumac. Make the perfect Pide - Turkish Flatbreads with the option of Roasted Beef, or a Vegetarian Option with Feta. Fluffy, light, zingy, yoghurty and sweet. No wonder it is one of the most popular desserts in Turkey. Plan a Turkish Dinner Party? Impress your guests with beautiful Turkish Dishes. Join us and find out how! Once you have mastered making the above dishes why not throw a party and invite friends to admire your creations? We are happy to cater for dietary requirements for this class. For this class we can cater for Gluten Free, Vegetarian, Vegan, Dairy Free or additional combos. Includes 3 hour workshop with your delicious meal at the end. We can tailor a class to your time, budget and specification.